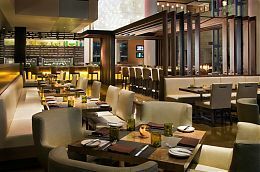 Chef Kerry Simon brings his own twist to the classic holiday meal, featuring flavors such as braised lamb, duck confit and cauliflower panacotta, complemented by deliciously decadent desserts. Four-course, prix fixe menu served April 8thfrom 5:30 - 10pm. Celebrate the season of renewal with a distinct selection of spa treatments using plant-based, active ingredients to naturally refresh and revitalize your mind, body and spirit. *April 1-30, book any Spring Spa Special and a 10 percent donation will be made towards environmental charities and foundations. 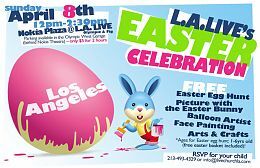 Join the Easter fun at Nokia Plaza L.A. LIVE this Sunday, April 8th! From 12 - 2:30pm, kids ages 1-6 years old can enjoy a free Easter Egg Hunt, photos with the Easter Bunny, balloon artists, face painting and holiday arts & crafts. Hop to it!